“Count their chickens before they hatch,” God said. Wisdom would generally say the opposite of this. You don’t usually want to count your chickens before they hatch. A couple of examples: you don’t want to spend money until you actually have it in your hand; or you don’t want to celebrate victory until you’ve actually achieved it. To do otherwise would be presumptuous and could end in humiliation, and potentially disaster, if your desired outcome doesn’t happen after you’ve gambled it. You don’t want to be like Clark Griswold who promised to fly his entire family out for the opening day of their new pool they would build with the annual bonus… that he later found out he wasn’t getting. This was His response as she was praying for wisdom about how she needs to handle someone she was having… let’s just say “challenges”… with, someone who maybe could use some refining in their rough-edged people skills. At first, she was baffled. “This doesn’t SOUND like wisdom, but it FEELS like wisdom.” As she pondered it, the Holy Spirit showed her the meaning. Allow me to unpack some context and then I’ll explain the meaning. In our kingdom-minded prophetic culture, we are continually learning to increase in our ability to view other people the way God sees them. It is the typical first response of most to evaluate people’s appearance and personalities so we can quickly rank if we can (or should I say “want to”) relate to them and how much of our time and attention we are willing to extend. “The LORD does not see as man sees, for man looks at the outward appearance, but the LORD looks at the heart,” (1 Samuel 16:7). As children of God, we have actually become born again in the Spirit. The Bible teaches us that in our salvation, the old sinful nature has actually been crucified with Christ and died with Him, and that we actually received newness of life in Christ through His resurrection. This is called being “born again.” All Christians are of a different spirit, a new nature, that comes from our Papa. His name is God. Yahweh. The King of Kings. Being children of Him means that we are princes and princesses, of the royal line. That’s who we are! But that doesn’t mean that’s who we all believe we are or what we are all currently experiencing. Most Christians still have a lot of room to grow in their understanding and experience of this. That gap between present experience and absolute truth is simply ignorance (in the best sense of the word). Lack of understanding of that which already is. But that’s why God gave us the Holy Spirit: to reveal all truth to us! One cool thing about God is He sees the end from the beginning. Paul said, “For I am confident of this very thing, that He who began a good work in you will perfect it until the day of Christ Jesus,” (Phil 1:6). That lifelong process of God perfecting us is simply Him helping our beliefs and experiences to catch up to that which He has already done in our spirits within. He already sees us as the finished product on the inside (where it counts most), and He is causing our outward realities to catch up to our inward realities. Since God sees the finished product of perfection in us already, how should we see each other? Should we continue looking at the outward appearance, or should we enter into the God-realm? “Therefore from now on we recognize no one according to the flesh,” (2Cor 5:16). If we want to function from a kingdom level, we cannot continue sizing people up by appearance and personality to see if they fit in our comfort box. I’m not saying it means we have to become best friends with everyone. But what I am saying is people need us to come into contact and awareness of who they really are underneath the epidermis level. We can’t stop at shallow; we need to drill into the true heart of people. Everybody deserves to be known for who they truly are. And here’s the deeper truth. Nobody fully knows who they truly are yet. We are all on the journey of discovery. The more Christ is revealed to us, the more we are revealed to ourselves, because we have been given the nature of Christ. It doesn’t matter how the world views any single person, good or bad, EVERY person in the world has gold stored in them at some level. Not everyone is aware of their gold. God’s version of prophecy is to perceive past the exterior (where most people’s sight is limited to) and find the greatness that He has hidden in each person. God sees it all equally. He isn’t focusing on the bad stuff; He adores the beauty within. He wants each person to know the greatness that He sees. He sees you like He sees His firstborn Son, Jesus Christ. He sees them the same way. He is so excited for each person to come into this level of awareness. The more aware we become, the more we begin to live and act like it. Our outward actions and experiences always catch up to what we believe. “Let no corrupt word proceed out of your mouth, but what is good for necessary edification, that it may impart grace to the hearers,” (Ephesians 4:29). Prophesying God’s truth to people like this will actually impart a grace that will give them the supernatural ability to enter into the level of what you are calling them into. So, “counting their chickens before they hatch” is loaded with profound wisdom from God when it comes to our belief in other people. Not stopping at their flaws that make us uncomfortable. Loving them unconditionally with a belief that they are greater than how they are making us feel in the moment. The chickens that are about to hatch are expressions of the work of Christ’s perfection in them! This is God’s way! This is God’s view on you! 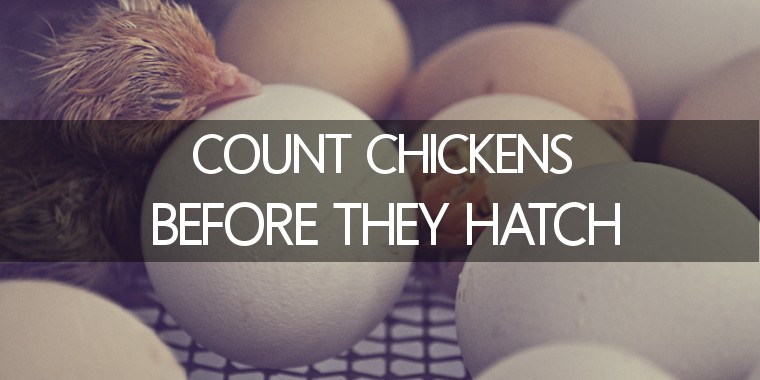 Maybe we can all up our game on counting other people’s chickens before they hatch!